Opening our new home at 65-81 Brisbane Street (from left) Lives Lived Well CEO, Mitchell Giles and Brisbane South AOD Team Leader, Ronelle Waring were joined by the Federal Member for Wright, Scott Buchholz MP and the Queensland State Member for Scenic Rim, John Krause MP. Aiming to deliver group programs including Smart Recovery and Breakthrough for Families information sessions, our Beaudesert team had outgrown its previous location at Illoura Carinity Care. The new, centrally located office at Shop 10, 65-81 Brisbane Street was opened with an official event on 30 January. 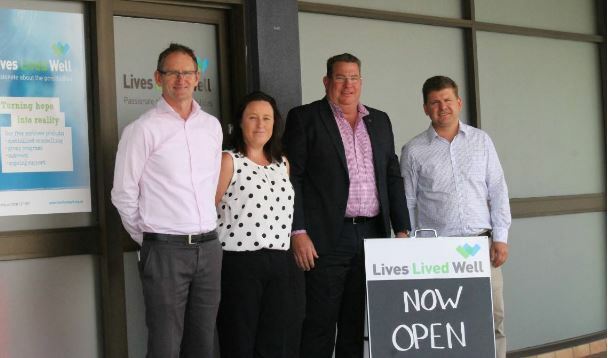 Lives Lived Well CEO, Mitchell Giles spoke at the opening alongside Federal Member Scott Buchholz MP, State Member Jon Krause MP and Brisbane South PHN’s General Manager of Commissioned Programs, Lucille Chalmers. Lucille told the gathering that Beaudesert was one of the priority areas for alcohol and drug support as identified in the Brisbane South PHN’s 2018 Needs Assessment, so she was pleased to be able to support an extension of services in the region. In the last financial year, Lives Lived Well supported 80 people through our Beaudesert service. Of those supported, most named methamphetamine (ICE) (42%) or alcohol (40%) as their primary drug of concern. Our Brisbane South AOD Team Leader, Ronelle Waring, said the move to premises in the main street had already had a dramatic impact on the number of people the team was supporting. “We have seen a 300 per cent increase in referrals, and many of these are self-referrals, which is fantastic,” she said.